When the two men washed up on the Swedish coast in a life raft turn out to be Latvians, Inspector Kurt Wallander hopes it will be a simple matter of passing the investigation over to Major Liepa, his Latvian counterpart asked to come to help with the case. However, when Major Liepa is found murdered shortly after his return to the Latvian capital, Riga, Wallander finds himself packing a bag and crossing the Baltic to assist with the investigations because the Latvian police believe that Liepa’s death may be linked to the case he had been working on in Sweden. “The Dogs of Riga” takes a profound turn from ordinary police procedural to international thriller that may disappoint some readers. 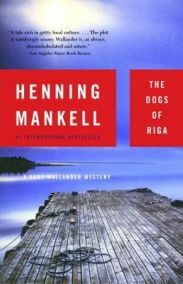 The book is the second of Henning Mankell’s series of novels featuring the lugubrious – some might say thoroughly miserable – Kurt Wallander. It was the first of the Wallander series I have read so the change in genre did not much matter to me though it may to those who consider themselves fans of the police procedural novel. “The Dogs of Riga” is set in 1991, a time when Latvia was in great upheaval, a time when the country’s immediate future was uncertain and the pro-Soviet authorities were striving to keep a grip on the country and to eliminate any pro-independence opposition. It’s a period that really interests me and this, combined with a trip to nearby Estonia, was the reason I chose to read the book. Some reviewers have suggested that the book is somewhat dated. In fact, it was some years after its publication in Sweden that this novel was finally translated into English and so, by then, the situation in Latvia was quite different. This means that while Sweden may not have changed much during the intervening years, Latvia is a very different place which does make the contrast between the two locations of the novel quite jarring. Soon after his arrival in Latvia, Wallander is contacted by an underground group whose goal is to bring independence and democracy to Latvia and I found this part of the story not only exciting but also interesting from a political/historical perspective, something that is often lacking in novels of this kind. From a literary point of view, I felt that Mankell painted an evocative picture of a drab city under the dominance of the Soviets, a place where violence and corruption were commonplace, a place with food shortages and where it pays to always look over your shoulder. I was also intrigued by the depiction of Sweden life too but I did feel that it was perhaps a little laboured, almost as if it had been written with the intention to enlighten non-Swedish readers. I read a lot of crime fiction and I do like to find novels set in countries that are unknown to me as I find it adds a new perspective. Over the years, Kurt Wallander has become something of a cult hero to crime fiction fans and, in spite of his dour demeanour, I warmed to him immediately. I was struck by the way that Henning Mankell manages to paint a portrait of this brooding, lonely middle-aged divorcee without letting it overshadow the rest of the story. Like with most crime fiction series, this is a character with a history and an ongoing personal life that, at times, merges with the story but it’s not overplayed and definitely makes Wallander a more convincing hero. It also explains why he works the way he does. Baiba Liepa, the Latvian Major’s widow was another interesting character though I did feel that her potential was not fully explored. The characters that belong only to this case are distinctly average. I rather liked the hard-working, intellectual Major Liepa and so I was disappointed to have only enjoyed his company for so short a time before his demise. This is a character I would like to see Mankell explore further so an off-shoot series of novels featuring a Latvian police detective would be welcomed though unlikely. The two officers who are leading the investigation into Liepa’s death constituted the biggest flaw in the book. I found these characters so similar and hard to distinguish that I had often to re-read sections to make sure I understood who was doing what and, worst of all, this confusion slowed down the dramatic ending. The other characters such as the political activists did not feature sufficiently to make much of an impact but they and Wallander’s colleagues in Sweden seemed credible enough. 3 Comments on "The Dogs of Riga: A Kurt Wallander Mystery"
I also came to The Dogs of Riga having only read one previous Wallander book. I read some other reviews from readers who thought Kurt had become a sort of ‘James Bond’ character, but this is nonsense. This is a good read, full of action and intrigue. Wallander is becoming more defined and his relationship with Baiba is on that is developed in subsequent books. He paints Riga as a very depressing place, which it may have been, and certainly on this reading it is not a place I would care to visit. Unlike Ystad, in Sweden, Wallander’s home. This sounds a wonderful place, despite all the murders! The characters evolve in the series – I’ve now read around five of them – and they are immensely enjoyable. I was never a fan of police procedurals until I happened upon Wallander, but I am now. I wouldn’t recommend this as the first in the series to read, but I would most definately recommend it. Yes, I’ve watched both versions. I think it’s pointless to compare them, in all honesty. Both are fantastic interpretations, Brannagh a little too slim perhaps (! ), but such a performance. The story when his father died, the scene in the woman’s house when he pointed out his father’s signature on the painting, it was so real. What an actor! And the Swedish one is very special, but in a different way. I’m so sorry that version has come to an end – I used to look forward so much for Saturday nights on BBC4. Brannagh has done something very interesting, changing the sequence of the stories but maintaining the personal history. I can’t wait for the next three to be screened. Apparently, did you know, after the suicide of the actress who played Wallander’s daughter in the Swedish series, Henkell abandonned his plans to write more of the Linda Wallander stories. Just shows in what high esteem the author held the TV series.